H. Raja opened his interview with Behindwoods Air, Madai Thirandhu show, asking how do you consider Karti Chidambaram a fit candidate when asked about how he was better than him. When asked about how he was better than Senthil Raja, ADMK's candidate, whose seat has been given to H. Raja, he chose to respond saying "You always cross your limits." He added that media's intention is to create drama. When asked about why MGR's songs were used during the campaign, he argued and said "it is meaningless and it is motivated." He again complained that media have some motives. When talking about ADMK's manifesto, the anchor spoke about the minorities' benefits and how it was against BJP, H. Raja threw a question "Have you stopped beating your wife? say yes or no" to the anchor Gabriel, to which he funnily replied, "I am still a bachelor." Continuing, he said which is feasible or not will be seen later and common grounds will be drawn. He also stated that "you people have got malicious intentions of creating rifts and I am not yielding." He asked the anchor to drop the question. He evaded answering about the coalition and instead chose to blame Rahul Gandhi. He also spoke about Chidambaram's family and the cases related to them and the Vinayaka Chaturthi case related to him. Finally, the anchor thanked him and remarked that this was the first interview he took past midnight. For detailed interview, you can watch the entire video here. என் வாழ்க்கை படத்தின் கதாநாயகி யார் தெரியுமா? ராகுல் காந்தியின் சுவாரஸ்ய பதில்! This page contains news relating to various facts and events. The views are generally about current affiars and general topics in diversified areas such as political, international, national, and regional issues, sports, health, travel, lifestyle, technology and business. People having similar interets on the above topics will find this page useful. 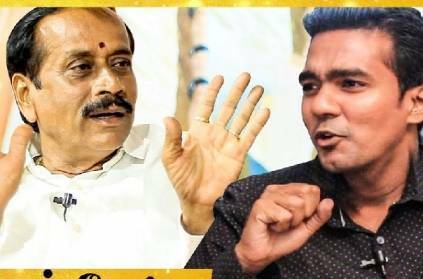 You always cross your limits H. Raja lashes out at anchor | Tamil Nadu News.